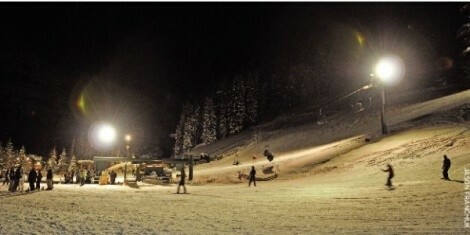 Nighttime skiing was already strong in the area, but Sundance certainly enhances the variety. An idea 13 years in the making is now a glistening, almost-fantasy reality at the Provo Canyon enclave. Night skiing started on the front mountain four days before Christmas. Sundance staff members report that in the daytime, unless someone knew there was night skiing there, the extra gear is hardly noticeable. There are a few spots for skiers, riders or even spectators to grab a warm drink and sit by a fire pit while listening to the sweet sounds of plush snow being zoomed through. “It’s just magical, isn’t it?” says mountain operations manager Jerry Warren. The question for years around these parts was whether skiing would hinder what owner Robert Redford has tried to achieve as far as quaintness and environmental sanctity. Could the narrow road leading up to the resort handle the traffic? Would there even be an interest from locals in skiing there, when Sundance has the shortest season in the area? If the response to the night shift is any indication, Sundance will become a “travel treat” for those outside of Utah County. Five other Utah ski resorts offer action past the typical lift-closing time of 4 p.m. Warren believes that his place has caught up with the others that sit fairly close (including Brighton, Park City and Snowbird) in facilities and snowmaking qualities, and that there is more than enough business to go around. Sundance’s front mountain will be illuminated on Monday, Wednesday, Friday and Saturday nights until the end of the season. That plan will be evaluated at the end of the winter. For now, sessions run from 4:30 to 9 p.m., costing $25 for adults, $18 for children and $10 for seniors. So, how did Sundance work its way to the dark side? Studies actually started over the summer, when the resort features its increasingly popular full-moon lift rides. On those clear nights, upward of 1,000 visitors were there between 9 and 11 p.m.
That’s true, in more ways than just the weather.